Enjoy a unique in-depth vacation in the fascinating regions of Umbria and Tuscany. Learn about the mysterious Etruscans. Start and end in Rome, where you will enjoy welcome and farewell dinners with wine at local restaurants. Stop in the hilltop town of Narni, inspiration for the Chronicles of Narnia, and visit the Convent of San Domenico. Highlights are a pasta demonstration by a chef to learn the art of homemade Manfricolo pasta, followed by lunch, and an olive oil tasting in Spello. Stay two nights in Assisi, and hear all about St. Francis and St. Clare as you visit their basilicas with a Local Guide. Enjoy an excursion to Perugia, where a visit to the Perugina Baci chocolate factory is included, as well as dinner in the town of Deruta. Stop in Cortona, made famous by the movie Under the Tuscan Sun. 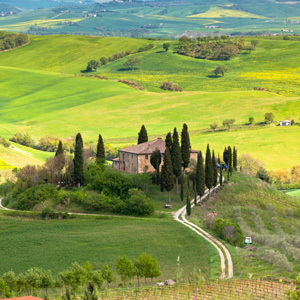 Stay two nights in Siena with an included excursion to picturesque Pienza, famous for pecorino cheese, and Montalcino, where a Brunello wine tasting and lunch await you. Enjoy picturesque San Gimignano and the town of Volterra. On to Orvieto, high atop a volcanic rock, where you hear about the Etruscans during a unique visit to the Etruscan underground Labirinto. An exclusive dinner has been prepared for you by the famous Italian cook, Maurizio. This is an unforgettable vacation! $2449; Double Occupancy – per person rate; Air fare not included. Air fare varies depending on departure city and date. Six story Hotel with early 20th century furnishings; located downtown; 100 meters from Termini Station. Contemporary hotel centrally located near Via Veneto for shopping and Villa Borghese – Spacious, elegantly furnished guestrooms. Set in the elegant residential district of Parioli, within walking distance from the Borghese Gardens with its extraordinary museum, the Hilton Garden Inn Rome Claridge hotel is perfect for either a business break or a relaxed Roman holiday. Set in a charming place of peace, between the green of the olive trees of the surrounding hills, the Ròseo Hotel Assisi enhances the nuances, aromas and flavors of this earth uniting with the best hospitality and courtesy taste, refinement and elegance to the attention for every little detail. The GRAND HOTEL ITALIA is located in the historic center of Orvieto, next to the suggestive “Palazzo del Capitano del Popolo”, now Convention center, to the Cathedral and to the most important monuments of the medieval city. Its large terraces with hanging gardens are open over the panorama of the city of the tuff, discovering the antique beauties. Magnificent Spello with Dinner Take a short drive south to reach beautiful Spello. Admire the well-preserved Roman stone arches, forming entry gates into the Old Town, and the medieval tower with an olive tree on top, symbol of peace and of the most typical local product- olive oil. Stroll along the narrow cobblestone streets lined with simple, elegant homes built from pink and white limestone, and soak up the unique atmosphere of this charming Umbrian town. Enjoy dinner with wine or soft drinks at a local restaurant to taste the specialties of this region. Excursion to Monteriggioni and Cherry Dinner Nested on a natural hillock about 12 miles (20 km) from Siena, Monteriggioni is undoubtedly one of the most classical, well preserved and best known medieval walled towns. Even the Italian poet Dante Alighieri mentions his ’round enclosure’ in the Divine Comedy (Hell, chant XXXI vv. 40-41). The town was built by the Senesis in the 13th century and its ideal position allowed them to control the Elsa and Staggia Valleys in the direction of Florence, the historic enemy of Siena, that at that time was rapidly expanding its territory. The walls, nearly intact, cover a length of 570 meters and are alternated by 14 towers and two gates, the Senese Gate and the Florence Gate. Recently a part of the wall walk of the town walls has been restored and made accessible. From the top of the walled circuit, it is possible to admire the surrounding Chianti countryside. After the visit let us spoil you with a delicious 4-course dinner, including unlimited drinks, in a traditional family owned agriturismo (farmhouse). Taste locally produced wines, Italian antipasti, home made pasta and discover exactly what cherries have to do with all of this…? The Abbey of Monte Oliveto Maggiore Followed by Dinner The imposing Arch Abbey of Monte Oliveto Maggiore has been built thanks to the initiative of Bernardo Tolomei (1272-1348), a man of God who embraced the rule of St. Benedict order. Together with a Olivetan Benedictine Monk visit the Church constructed between 1400 and 1417 in Romanesque-Gothic style, see the crypt used by the Community for liturgical celebration in winter, the Library and the Cloister with its 35 large frescoes depicting the life of St. Benedict. In the herbalist shops you can find locally produced tea, soaps, oils and organic juices. After the visit, drive to a nearby Trattoria where you will be served a tasty 3-course dinner based on local specialties. Local wine is included and Buon Appetito!